Personal hygiene begins and ends with our hands. And though we’re taught as youngsters to wash our hands before dinner, it’s important to remember that germs don’t care what time of day it is. Clean hands prevent sickness. So it’s especially important to learn the basics about hand hygiene so that you, too, can become a champion hand washer! Let’s examine some handy (see what we did there?) tips and info in honor of National Handwashing Awareness Week, which takes place each year during the first week of December. Frenchman Louis Pasteur begins researching causes and prevention of disease, leading to his breakthroughs in vaccination and what came to be known as pasteurization. Ignaz Philipp Semmelweis, a pioneer in and advocate for antiseptic procedures, is born in Hungary. Italian entomologist Agostino Bassi discovers that microorganisms can cause disease. Italian scholar and poet Girolamo Fracastoro suggests that epidemics are caused by small particles or "spores" that can be transmitted from one person to another. The ancient Greek historian Thucydides is the first to suggest that disease can spread from one person to another. The Centers for Disease Control and Prevention calls hand washing "a do-it-yourself vaccine" and suggests remembering five easy steps: Wet, lather, scrub, rinse, dry. Endorsed by the American Medical Association and American Academy of Family Physicians, the four principles are: 1) Wash your hands when they are dirty and before eating; 2) Do not cough into hands; 3) Do not sneeze into hands; and 4) Don't put your fingers in your eyes, nose or mouth. 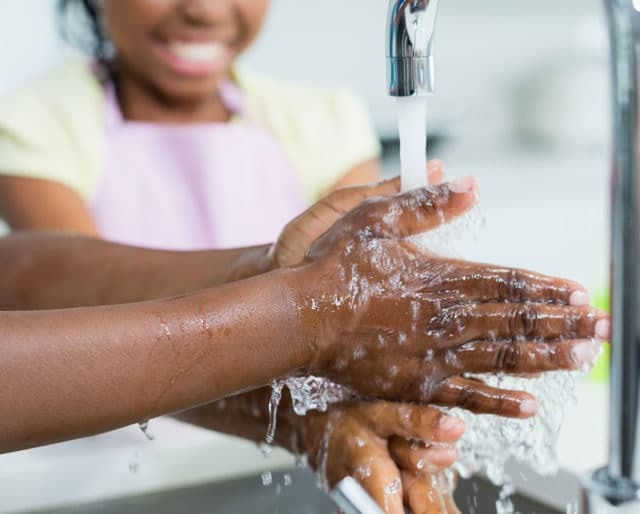 According to the Centers for Disease Control and Prevention, handwashing can prevent 1 in 3 diarrhea-related illnesses and 1 in 5 infections, including the flu. About 1.4 million children under age 5 die from diarrheal diseases and pneumonia — the two most deadly afflictions for children worldwide. The CDC also reports that only 31 percent of men and 65 percent of women washed their hands after using a public restroom. A typical human sneeze exits the body at about 200 miles per hour and emits around 40,000 droplets into the air. And happy hands make for happy and healthy homes. Think of how many different things we touch during the course of an average day. Now imagine how many of those things were touched by other people's hands. Yuck! Wash your hands to prevent the spread of dangerous microbes. Finally, we love National Handwashing Awareness Week because it reminds everybody else — especially doctors and those who prepare the food we eat — to take cleanliness and hygiene seriously.